In an era when many independent haunts have been driven out of business by the major Halloween Theme Parks, it's big news to see a new multi-haunt attraction opening in the Los Angeles area. 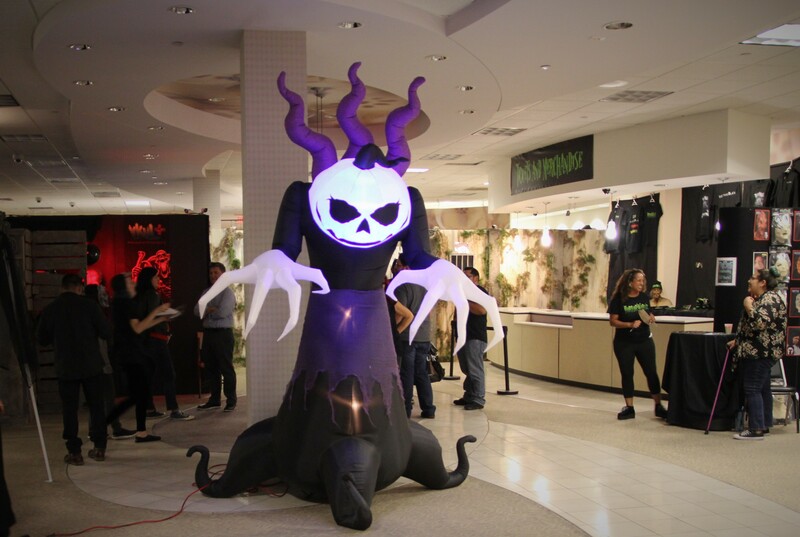 Making its debut in the Puente Hills Mall on Friday, HorrorWorld offers three mazes and a virtual reality experience, ensconced in a comfortable retail setting, complete with vendors selling everything from t-shirts and collectibles to coffee and cupcakes (suitably themed, of course). The haunt should be near the top of every haunt-seeker's must-see list. HorrorWorld is not completely new, per se; rather, it's an amalgamation of new and pre-existing attractions, organized by Boneyard Effects, which debuted Into the Black at the Pomona Fairgrounds last year. Working on the theory that customers who visit one maze would probably enjoy another, Boneyard Effects decided to move to a new location and expand their attraction for Halloween 2018, crafting a new maze, Psycho Sanitarium. 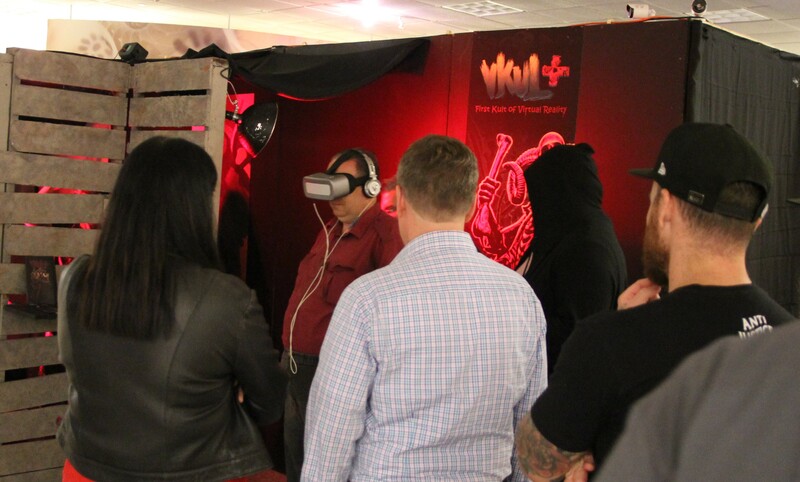 The Fleshyard, which had been haunting Anaheim for a few seasons, joined the effort, along with Imaginerick, which supplied the VR experience, VKULT. The result is an impressive variety of Halloween horror that can be enjoyed without the inconvenience of traipsing up Six Flags Magic Mountain or taking a mile-long escalator down to the lower lot of Universal Studios Hollywood. HorrorWorld held its press night on Tuesday. Since this was a preview - not all the lighting and effects were in place - what follows is not a review but rather our best extrapolation of what horror fans can expect. HorrorWorld is situated on the top floor of the Puente Hills Mall, near the central escalator. The event takes up three retail spaces, side by side. 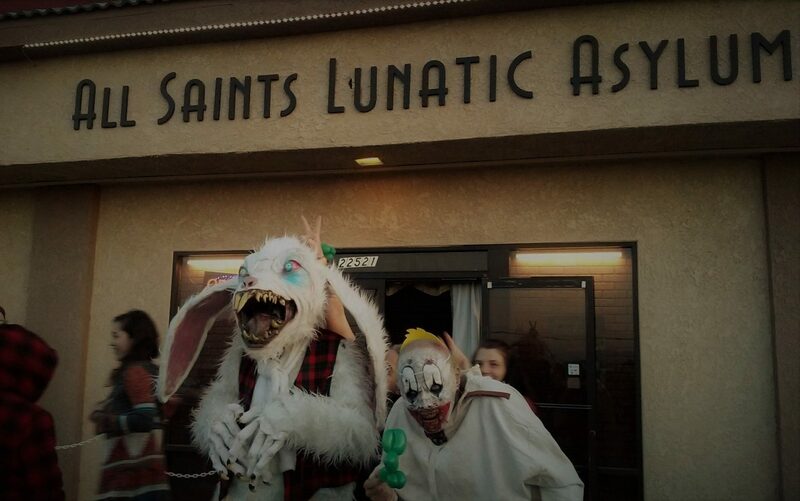 The first contains vendors, box office, Psycho Sanitarium, and VKULT. The adjoining retail spaces contain The Fleshyard and Into The Black. 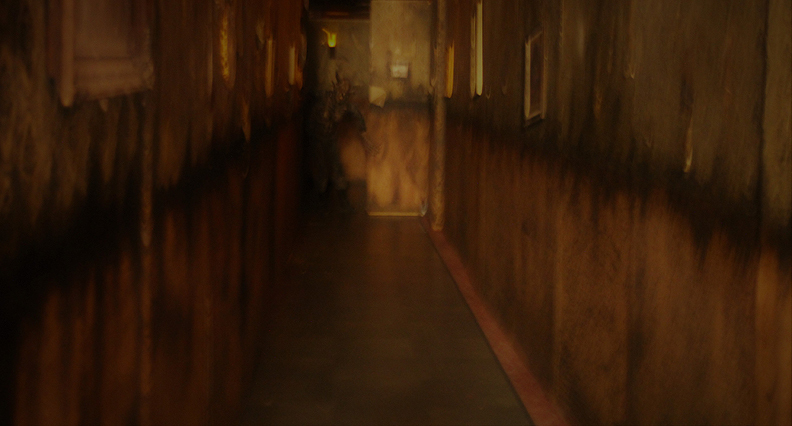 Click on this image to see what lurks in darkness at the end of the hall. Into The Black - which creeped us out as few Halloween mazes ever do - is the star attraction. The maze is slightly shorter this year, with less buildup before the first demons appear. The initial effect is a bit like a conventional jump-scare, but the maze soon settles into its groove, which emphasizes anticipation. Shadows and sounds combine to invoke a sense of being stalked by lurking things playing a monstrous game of cat-and-mouse, toying with victims until a jump is longer needed to deliver the scare; simply revealing themselves is enough send a clammy sense of frisson down one's trembling spine. The Fleshyard is noticeably expanded from its previous incarnations. 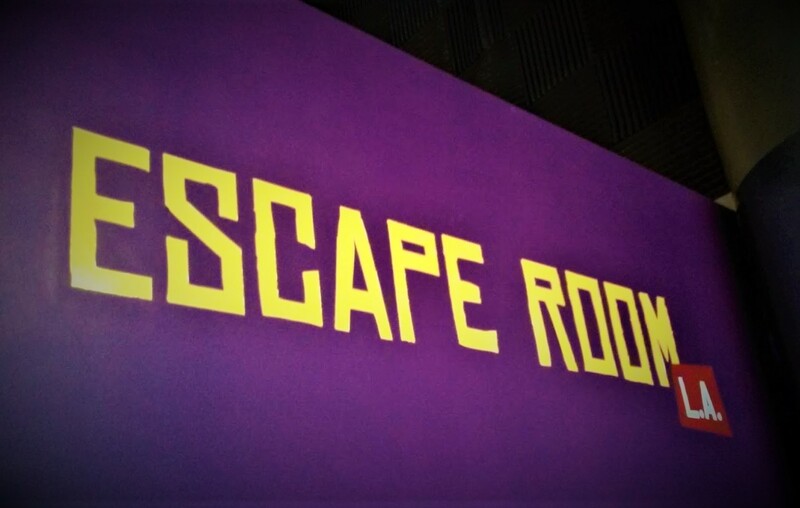 Now situated behind a facade resembling a Spanish mission or hacienda, the maze has added new rooms and more drama, including an introductory scene to establish the back story and a wild, climactic exorcism near the end. Full Disclosure: the emphasis on story is, according to the proprietor, in response to my 2016 review, which mildly chided The Fleshyard for not having a stronger theme to connect its entertaining elements. I guess this puts me in the position of rock journalist Nik Cohn, a pinball fan for whom Pete Townshend wrote the song "Pinball Wizard," so that Cohn would like The Who's album Tommy. Cohn's response: "It's a masterpiece." If I go that far, it might sound insincere, so I will just say that The Fleshyard is highly recommended - providing a more visceral contrast to Into the Black. Psycho Sanitarium is more boisterous than either of the other mazes. It's a kind of crazy lights-on haunt, with over-the-top grue perpetrated by actors having a tremendous time doing what they do. The energetic result is more black comedy than horror show, but it's definitely entertaining. VKULT is the opposite of a "free-roaming" virtual reality experience: instead of moving freely through the virtual environment, each participant is physically strapped into a vertical gurney like Hannibal Lecter in Silence of the Lambs; thus immobilized, the viewer watches helplessly as a live-action horror movie plays through the VR headset, enhanced by blasts of compressed air, drops of water, and other physical sensations administered by attendants. The experience is somewhat passive - like watching a 3D movie - and we found VKULT's scare tactics to be a bit too crude for our taste (helpless female victim running down corridors, cult fanatic slitting a victim's throat). Fortunately, the fish-eye look of the photography emphasizes the immersive quality of the VR experience to an impressive degree, and a sudden shift in perspective near the end switches the viewer from observer to victim for an unexpected first-person finale that makes you an unwilling participant in the action. HorrorWorld is the kind of multi-maze haunt that barely exists anymore, at least in Los Angeles. Under one roof, it conveniently brings together a quartet of haunted attractions that should give Halloween fans plenty to scream about. HorrorWorld runs on select dates from September 28 through October 31. Hours are 6:00pm to midnight. Tickets are $20 for Into the Black and The Fleshyard, $15 for Psycho Sanitarium, and $45 for an All Access pass. The Puente Hills Mall is located at 1600 S Azusa Avenue in Rowland Heights, 91748. Get more info at HorrorWorld.biz.